A simple preparation turns plain nuts into something stellar for salads or snacks; revise the spices in Candied Cinnamon and Sugar Pecans for more unique flavors! To tell you the truth, the only reason I’m sharing this recipe is because I made them for a salad. My original intent would to have included the recipe with the salad I had planned and that was that. But; always a but, right? My neighbor showed up for some of the salad fixings and could not stop snacking on the nuts; she’s the one who convinced me they needed their own place in the sun…and she is right! 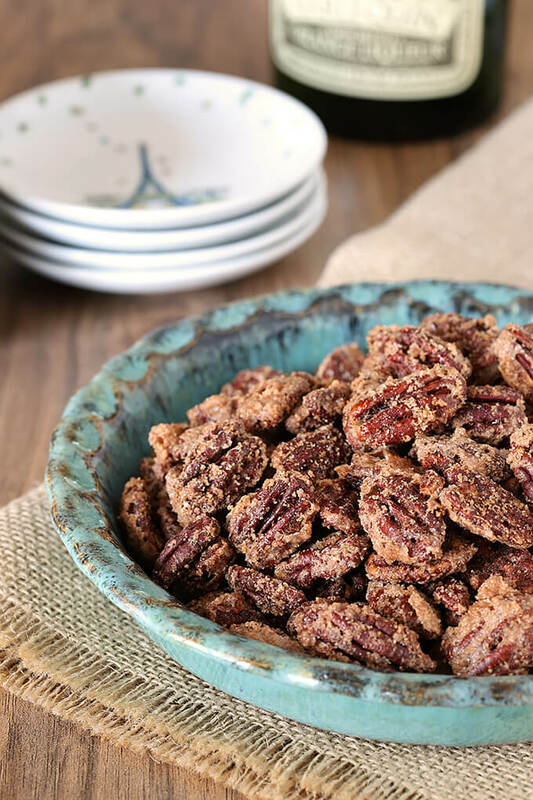 These Candied Cinnamon and Sugar Pecans are the simplest version of candied nuts that I make. Even with that touch of cinnamon, they work in any salad I want to add them to and they’re always on hand over the holidays in bowls set out in the kitchen for friends and family to munch on when they drop by. Still, as good as they are I do love to get creative. For everyday, I stick to cinnamon and sugar but for the Christmas holidays I always add some nutmeg to the mix too. Another favorite is a version with a bit of heat; subbing out the spices for cayenne pepper does the trick; a great taste with sweet and hot; perfect with margaritas! Mix up the nuts too; use walnuts or mixed nuts or whatever your heart desires; just keep the quantities the same and anything is game. They’re so simple too; whisk an egg white with a bit of water, coat the nuts and then mix in some sugar, cinnamon and salt. Bake for 45 minutes and done. They’re so easy it’s a good thing I forget that on a regular basis or I would be eating these by the handful every day! As much as I love them as a snack, (great on a cheese board too), it is for salads that I really love them. 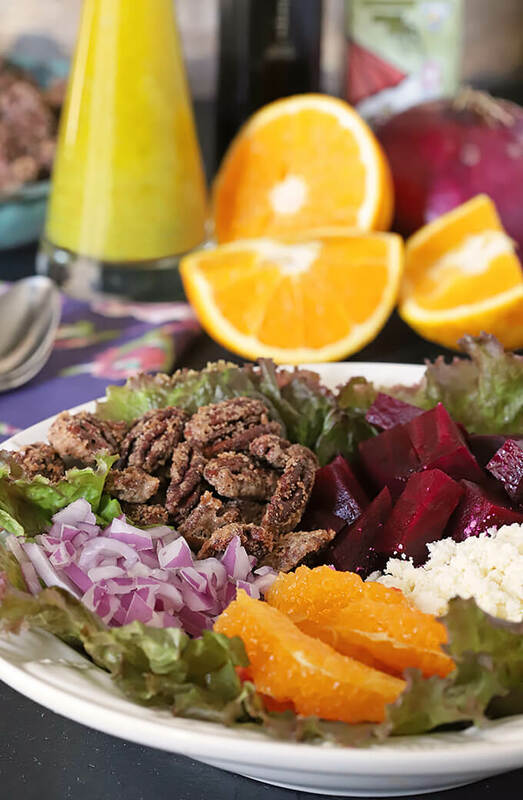 The sugary coating that is baked on makes them a crispy addition to salads and they were absolutely perfect in this salad with roasted beets, oranges, onion, and feta cheese. I know, looks good doesn’t it? Served with an orange poppy seed dressing, it’s my new favorite. When I was working on my deck and yard this spring I found my salvation for quick meals at Sprouts Market. They became my go to for a bite when I just had no energy left. A huge favorite was their beet salad so I knew I had to make my own version. This is very similar but with the addition of the orange segments. I had oranges on hand, so why not? Look for the salad recipe with an orange poppy seed dressing next week; it’s delicious too! 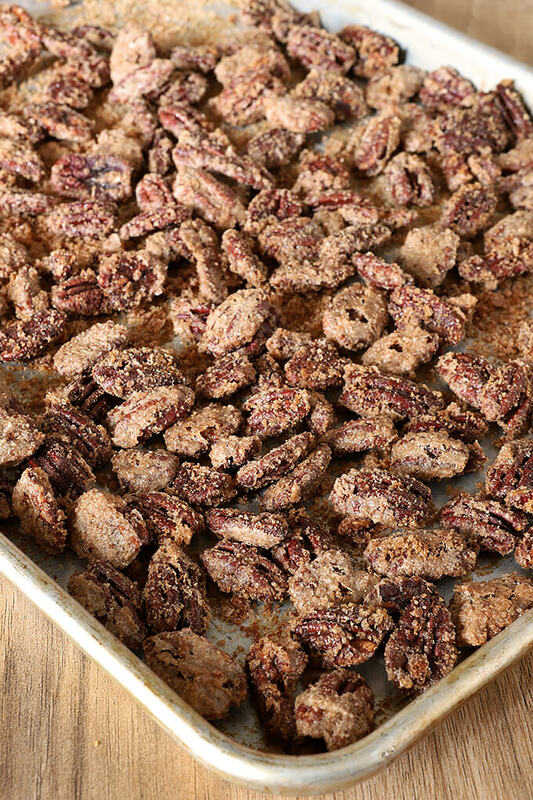 In the meantime, go on, make these Candied Cinnamon Sugar Pecans; bet you can’t eat just one! Preheat oven to 300°F. Line a large baking sheet with parchment paper or aluminum foil and set aside. Whisk the egg white and water together in a medium bowl until well combined. Add the pecans and stir until all of the pieces are coated. In a separate bowl, whisk together the sugar, cinnamon, and salt. Pour the cinnamon sugar mixture over the pecans and stir until all of the pecans are fully coated. Spread the pecans onto the prepared baking sheet in a single layer. Bake at 300°F for 45 minutes, stirring the pecans every 15 minutes. Remove from the oven and allow to cool completely on the baking sheet; breaking apart any pieces that are stuck together. Store in an airtight container up to a month. These can be varied with the use of different nuts and seasonings. Try adding 1/2 tsp nutmeg to the mixture in the recipe or substitute cayenne pepper for the spices and make some with a bit of heat! If you needed to make these vegan; no egg…how would you do that? These sound great and I can imagine using them in so many different recipes. They are so good; my niece saw my post on Facebook and said she’s lucky if she can use them in any way after her husband discovers them; he devours them. They are pretty addictive! If I made these I’m not sure they’d ever make it to the salad — my taste testing would probably finish them off. 🙂 These look excellent — gotta make these. Thanks! They are so easy and I know you would have no problem mixing up the spices a bit too!